Last week my daughter and I went to Indianapolis to hear the Jack Quartet play Georg Friedrich Haas‘ String Quartet No. 3, “In iij. Nocht.” The Jack was in Indianapolis for two concerts sponsored by the Ensemble Music Society of Indianapolis, but I zeroed in on the Haas because it is a work that requires a unique presentation that cannot be easily duplicated on a recording. Lasting anywhere from 35 minutes to “significantly longer,” the performance instructions call for the work to be performed in total darkness. At the Big Car Service Center last week the room was appropriately prepared. I couldn’t see my own hand in front of my face. Alex Ross wrote of his experience with the blackout as feeling “a fear such as I’ve never experienced in a concert hall.” It wasn’t fear that I experienced. It was disorientation, leading to complete disassociation. Without sight you lose any connection to the other audience members. It becomes a personal experience between you, the quartet, and the music. In fact, anything that interrupted the isolation became a disturbance that you wanted to end as quickly as possible. I leaned forward and accidentally touched a coat on the chair in front of me. Suddenly I was back in a concert hall surrounded by people. I had to lean back and reëstablish my isolation. The music demanded it. The music itself is beautiful, haunting, and tangible. It surrounds you. The performers sit in the corners of the room (not quite corners in this case, as the Service Center isn’t four-sided). Since the musicians can’t see each other, or even their own instruments, all their communication is by the music itself. The listener becomes intensely aware of this communication. Any musician may “invite” the other performers to move to a different section of the work by playing material from that section. If the other players want to move, they join the invitation musically. As the work progressed you found yourself very interested in new material being presented, wanting to know if the other players would accept or reject the invitations. The performance is open-ended, except for the specification that a Gesualdo quote occur at the three-quarters point. Once the quote begins, the general proportion of the work is set. Performing without access to time keeping creates questions, such as how do you really know how long you’ve been playing? I talked with violinist John Pickford Richards afterwards and asked him about time. In concert they have to at least set a target duration for programming purposes. They planned on a performance that would last around 50 – 55 minutes. And they ended up with a performance right in that time period. Richards said that they frequently feel like they start the Gesualdo quote too soon, resulting in a mini-panic, but when the lights go up they find that they’ve hit their target almost all the time. A lot of it has to do with thinking of time in smaller segments, and how many repetitions fit into what amount of time. But they have also rehearsed and performed the piece so much that they have internalized the duration – which is remarkable given the time frame of the piece. On a personal level, my daughter and I had a similar reaction to the perception of time as the audience member in this video. We felt like the piece lasted about 30 minutes, tops. Nothing near the scale of an hour. And as you can tell, I thought the piece and performance was wonderful. My 13-year-old daughter, easily the youngest person in the audience? She thought it was fantastic. Of course, she is a violinist, and daughter of two musicians, and she frequently attends concerts of everything from Bach to experimental computer music. But my happiness comes from her having such an open and adventurous mind. She begged to go to this concert with me, and we were both glad she did. …when it comes to reporting on music. NPR has been running a lot of stories about music perception, but they always seem to spin it in such a dumb way. Researchers in Australia undertook a very imaginative study that provides real insight into how we find music beautiful, even music that we’re told we shouldn’t like. It turns out that our theories of consonance and dissonance that we’ve been working with since Helmholtz are simply not supported by science. The researchers found that when listeners encountered unfamiliar chords – chords in which they couldn’t identify the pitches – they couldn’t even process the chord. It was like a word in a foreign language that they didn’t understand. The first experiment was setup to identify consonance and dissonance as a function of the relationships of pitch frequencies, based on the work of Helmholtz. But no correlation was found. Instead, they found that the ability of the subject to identify the pitches in the chord influenced their categorization of consonance/dissonance. The second experiment set out to test that idea more rigorously, by training non-musicians to identify the notes in some chords and not others. These subjects were then asked to listen and categorize chords as consonant or dissonant. Subjects consistently rated the chords that were taught to them as more consonant than chords that were unfamiliar to them, even if the familiar chords were considered more dissonant by our current theories. Which brings me back to the popular press – in this case, The Atlantic and NPR. The Atlantic does a fine job of capturing the importance of the science and the overall aesthetic implications for music. Their headline, “Study: Hearing Music as Beautiful is a Learned Trait” captures those aesthetic implications right at the outset, and “above the fold” as they used to say in newspaper terms. And they include a quote from a co-author that points to this study overturning centuries of science about dissonance being related to the construction of the human ear. NPR, in its Deceptive Cadence music blog, takes a more transformational approach to the story, focusing a great deal on hate. Take the title, “Can You Learn to Like Music You Hate?” Or the first sentence, “You hear some music you hate.” The actual study never deals with “the visceral response” that seems to preoccupy the NPR writer. Eventually, the NPR writer gets to the key finding, that listeners don’t even process unfamiliar chords – “not that they didn’t like it” – but the tone is set by the opening focus on hate. But the takeaway line, “the more you hear the more you love” swings and misses wildly. And the graphic caption, “harmony, it’s in the ear of the beholder” is exactly opposite of what the researchers found (it’s in the brain). Of course this is a play on a popular phrase, beauty is in the eye of the beholder, but it’s still not the point of the study. While I do appreciate NPR and Deceptive Cadence, their writing about music perception studies and how these relate to musical taste seems to try for that populist, Wolf-Blitzer-trying-to-be-Fox-News sort of reporting. This article is full of distortion that reflects more personal quirks of the author than the study being reported on (or really, the article about the study being reported on). It just seems like NPR should do better with art and culture. This video has been out for a while, but it is one of my favorites. It shows both the degree of creativity in commenting on the news of the day, and the extent to which Autotune is a ubiquitous part of daily life. This space has been dark for a while now – too long. I’ve been dealing with composer’s block for a while, and didn’t really want to push along with text while I couldn’t write music. Now I’ve decided to publicly work my way through it, and to document my work process along the way. Late this summer I received a grant from the Indiana Arts Commission to do a text-sound laptop performance piece based on Interlochen author Michael Delp‘s “Coast of Nowhere.” It’s a beautiful piece of prose that describes the lakefront that my family and I lived on for two summers while teaching at the Interlochen Arts Camp. I’m up in Interlochen right now, doing field recording, recording Delp, giving some master classes, and seeing some old friends. The field recording process has been revelatory so far. With sensitive microphones on high gain, and in the middle of the night, I’ve heard things in ways I’ve never heard before. Cliche, I know, but fun. I’m off to record the author now at Interlochen Public Radio, one of the best public radio stations in the country, tucked far away from even the hint of large city. With so many musical ideas in use, and overuse, it can be hard to avoid the neighborhood of any given cliché. This is especially true when it comes to sampling sounds. I tend to hammer on my students when they get too close to one, but often they don’t hear it the same way. Mostly this is due to a different level of experience, but the ensuing discussions too often make me sound like an old lunatic. I have to thank WordPress for this one. Their automatically generated “possibly related posts” feature helped me find a post on Entrepreneur the Arts with Barack Obama speaking about the importance of the arts. It was linked to my post on race and the arts. While he mentions some of the usual stuff about the arts improving your math scores, he stresses the bigger picture, the value of learning to be creative, and learning “to see the world through other people’s eyes.” It’s these other aspects that I find very important, both for the arts and especially for politics. You don’t always get an easy answer for every problem. Some actions don’t have an immediate, tangible benefit. But those activities still have value. Trying to write about an event that you’re working always turns out hard for me. Rather than let the event pass with only one measly post, I’m going for a post-post-mortem review or two. Tending towards the soft and gentle side of new music were works by Alexander Nohai-Seaman, Derek Healy, Richard Brooks, and Michael Young. Young gave an impressive performance of his work. Healy’s work is part of a set of Chinese folk songs that my colleague Mei Zhong is releasing on CD. Tending towards the modern were works by Eric Nathan, a gorgeous chamber ensemble work title Onement, Tom Wells’ Kisa, and of course, Elliott Carter. Notably different about the Carter guitar work, Shard, was its interpretation on electric guitar by Derek Johnson. The work that generated the most discussion was Jeff Stanek’s Love and Aggression, for electric guitar and amplified cello. What was interesting to me was the reaction by the college students, who seemed to be against the very idea of a cello playing through an amp, and playing with distortion. Many people have written about the connection between certain avenues of experimental rock and new music among younger composers, as exemplified by the Bang on a Can All Stars, the Wordless Music concerts, and others, but the connection seemed to be lost in this locale. Knowing the success of the above groups, it says more to me about the culture of young people locally. In advance of two concerts, the New York Times has an article on Frederic Rzewski. It’s an interesting piece. Rzewski, known for composing a number of pieces with strong left political references, completely downplays political ideology. While his political beliefs come through clearly in the body of his work, he understands that classical music isn’t really a strong platform for political and social change. 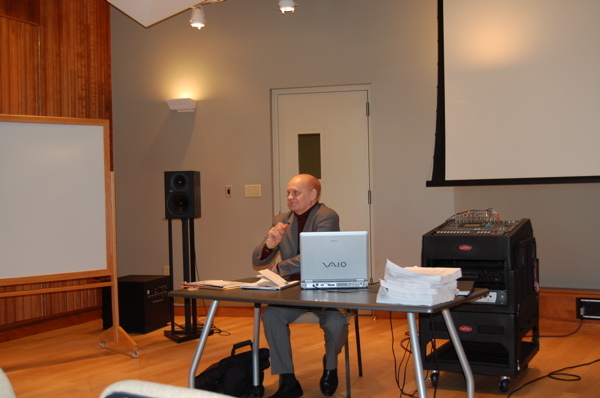 The 38th annual Festival of New Music is underway, with guest composer Thomas Wells giving a talk to our composition seminar yesterday. Wells is particularly interested in pedagogical and historical aspects of composition, and provided some fascinating history about his student days at the University of Texas, Austin. I might be more interested in this than most, since I was also a student there, but I tend to see the development of institutions as being similar to composition. Both are combinations of planned decisions and serendipitous discovery. You try things out, you revise along the way. Sometimes you don’t move on to new material soon enough. Some institutions are monothematic; others diverse collages of style and idea that you can navigate. Wells’s talk reminded of how much international exposure the university has provided to the community, and for how long. As a high school student Wells heard a talk by Karlheinz Stockhausen in 1963, and said that listening to Kontakt “blew my mind.” He studied with Stockhausen in 1968 and 1972. I’ll be posting more about the festival during and afterwards, and posting pictures to my Flickr stream, as well as the Facebook event page.